BRUCE SPRINGSTEEN & THE E-STREET BAND ILLUSTRATION! Hey everyone! Back again with a new finished piece of artwork this week for https://joedichiara.wordpress.com. This week’s art is a composition I did about one of my favorite Rock musicians Bruce Springsteen. Having grown up in New Jersey it is almost impossible to NOT like “The Boss”, whose music is infused with Jersey-Pride sentiment. I came up with this idea when I read about the upcoming documentary titled “The Promise: The Making of Darkness on the Edge of Town”. This documentary will be premiered on September 14, 2010 at the Toronto International Film Festival. Accompanying the film will be the reissue of Springsteen’s 1978 album “Darkness On The Edge Of Town”, which will include unreleased material from those studio sessions along with copies of Springsteen’s notes while recording the album. 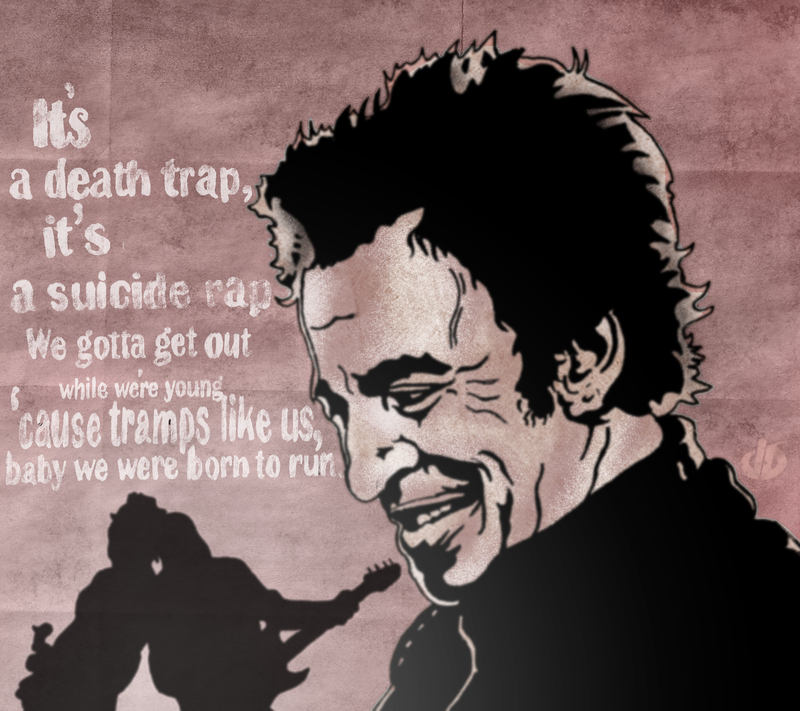 Here is my Bruce Springsteen & The E-Street Band Illustration which contains lyrics to his 1975 classic “Born To Run”. Be sure to check back for more updates and artwork to https://joedichiara.wordpress.com AND http://www.joedichiara.com! This week I included a video clip from the documentary enjoy! Wonderful – thank you so much!